“Slow An’ Easy” (U.S. 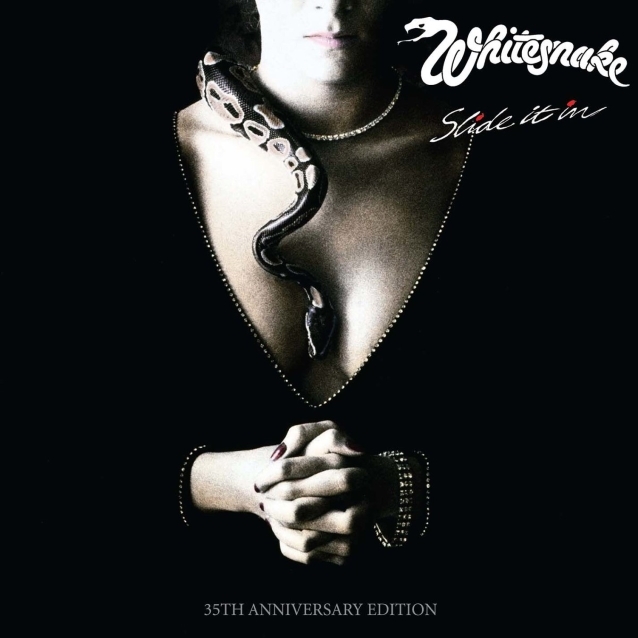 Mix, 2019 Remaster)” from WHITESNAKE can be streamed below. The track is featured on the upcoming 35th-anniversary edition of the band’s 1984 album, “Slide It In”. WHITESNAKE scored its first platinum-selling album with “Slide It In”, a release that has sold more than four million copies worldwide thanks to hard-rocking songs like “Love Ain’t No Stranger”, “Slow An’ Easy” and the title track. The classic album turns 35 this year and Rhino is celebrating with several new versions, including an enormous seven-disc box set. “Slide It In: The Ultimate Special Edition” will be available on March 22. The 6CD/DVD collection includes newly remastered versions of both the U.K. and U.S. mixes of the album, plus unreleased live and studio recordings, music videos, concert footage, and a new interview with WHITESNAKE founder and lead singer, David Coverdale. The music comes with a 60-page hardbound book that’s filled with rare photos and memorabilia from the era. Three other versions of “Slide It In” will also be available the same day. A double-CD “Deluxe Edition” includes the newly remastered U.K. and U.S. mixes expanded with a selection of bonus tracks. The double-LP “Deluxe Edition” features the newly remastered U.K. and U.S. mixes. And finally, a single-disc version includes the newly remastered U.S. mix. The music will be available digitally as well. After releasing “Saints & Sinners” in 1982, WHITESNAKE reconvened the following year in Germany to begin recording songs for what would become the band’s sixth studio album, “Slide It In”. At the time, band members included Coverdale, guitarists Micky Moody and Mel Galley, bassist Colin Hodgkinson and keyboardist Jon Lord. The album was initially released in 1984 in the U.K., where it climbed into the Top 10. Soon after, the band’s lineup changed. Lord left to rejoin DEEP PURPLE and Moody and Hodgkinson were replaced by guitarist John Sykes and Neil Murray, who was WHITESNAKE‘s original bassist. Prior to its U.S. release in 1985, “Slide It In” was remixed while newly recorded parts by Sykes, Murray and keyboardist Bill Cuomo were added, resulting in two distinct versions of the album, both of which are included in this set. “Slide It In: The Ultimate Special Edition” features unreleased versions of every album track, including 35th-anniversary remixes made this year, as well as monitor mixes recorded in 1983. The set boasts more than a dozen unreleased live recordings from 1984 that feature an entire concert from Glasgow, Scotland, plus several songs from Lord‘s final show with WHITESNAKE in Sweden. The collection’s final disc unearths 30 tracks that cover original demos and early mixes for album tracks, as well as unfinished song ideas. Coverdale says: “‘Slide It In’ was always meant to be a structured, more electric modern take on the classic blues-based hard rock that WHITESNAKE were famous for — but our new hook city hooligan, mixer extraordinaire Christopher Collier, has hand-tooled this classic record for the 21st century. “Hearing all the performances so fresh and so clear after 35 years was amazing. Mel, Cozy and Jon‘s playing on the record is as vital now as it was all those years ago. All the featured players shine. The complete track listing can be found at Whitesnake.com.